by Kara Lefevre PhD (Ecology and Evolution / Environmental Studies, University of Toronto 2008). 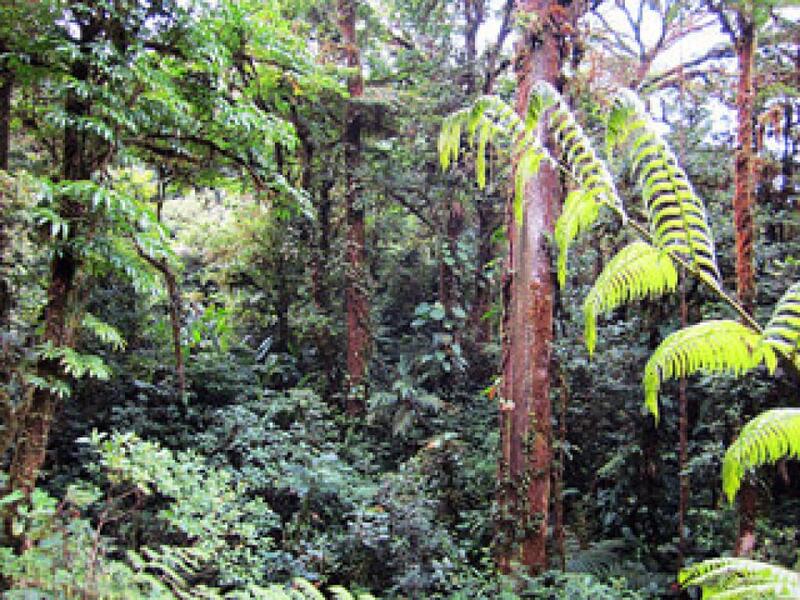 Most people are familiar with the concept of tropical rainforest. By definition these are rich, wet forests with at least 200 cm (almost 80”) of annual rainfall. They receive roughly an even amount of rain all year round. Forests that receive a lot of rainfall yet have a dry season are called “moist forests”. In popular usage, however, the distinction tends to get blurred and the term “rainforest” is applied to all lush, moist tropical forests. But what exactly defines a “cloud forest”? Clouds, of course! In the mountains, temperature declines as you climb, so there is more condensation and precipitation the higher up you go. This results in cool and humid “montane forests” at greater elevations. 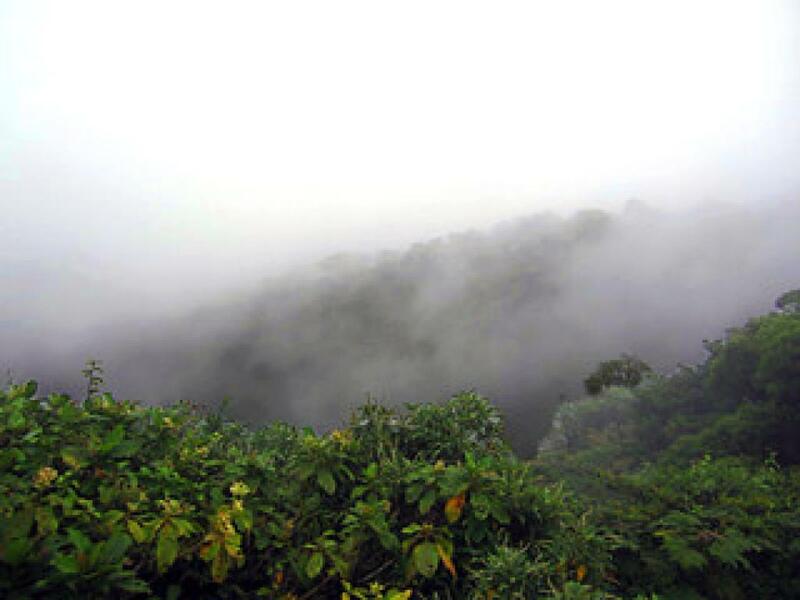 They are blanketed in heavy mist for at least part of each day, hence the term “cloud forest”. 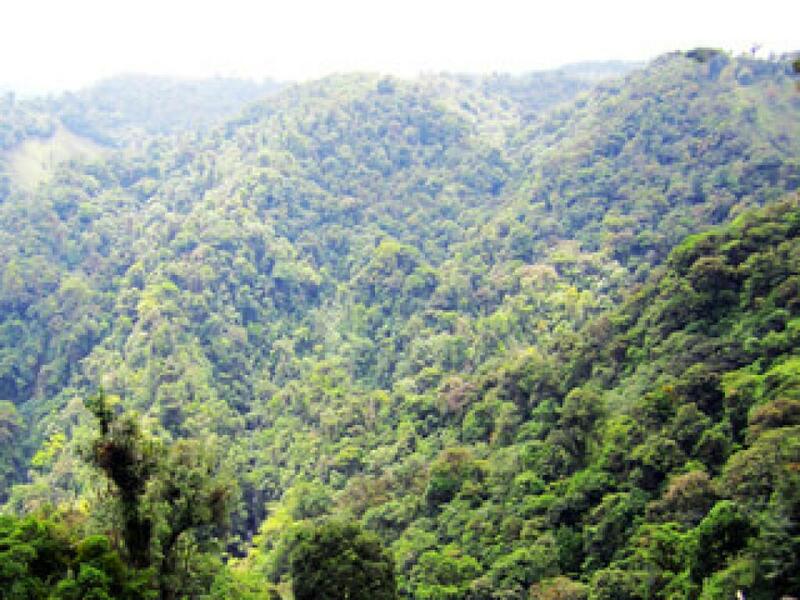 Cloud forests are found in various parts of the high-elevation tropics around the world. However they are uncommon, representing only 1.4% of global tropical forest area. They look and feel foggy and damp. The clouds help plants by minimizing water loss through leaves, and adding water to the soil through drip from the forest canopy. The presence of cloud cover allows less sunlight into the forest. The soil is wet and even gets waterlogged, much like conditions in a bog. Plant growth is slower because of the low levels of light and temperature. Trees are more densely spaced and shorter than in lowland rainforest, reaching heights of only 25 to 30m. Their crowns are compressed, trunks are more compact without the winged “buttresses” of lowland rainforest trees, and bark is darker and rougher. Leaves are smaller and waxy, thick and tough. The cloud forests of Monteverde in Costa Rica crown the crest of the Cordillera de Tilarán mountains. This range rises sharply from the lowlands in the west of the country to peaks higher than 1800 m. Lowland tropical wet forest occurs there below 700 m in elevation. 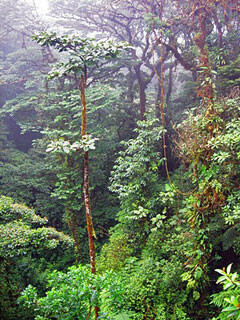 There is a transition to “premontane rainforest”, and then to cloud forest at the highest elevations. 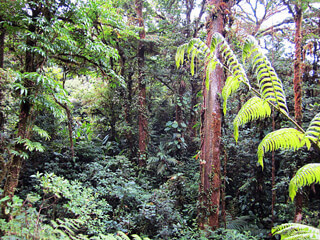 The North East trade winds, along with accompanying clouds, strongly influence Monteverde’s forest structure. At the highest elevations, the exposed peaks and ridges shelter a stunted type of vegetation known as “elfinwood” or “elfin forest”. Here, woody plants are shorter still. The vegetation becomes impenetrable, full of trees whose gnarled trunks are covered in thick carpets of other plants. So despite their conditions for slower growth, cloud forests support a rich bounty of plant life. These ecosystems are known for their high levels of endemism, meaning the evolution of unique species found nowhere else. The trees are covered with layers of other vegetation, epiphytes such as ferns, orchids, mosses, lichens, algae, bromeliads, and bryophytes. These grow on all available surfaces, encircling tree trunks and draping their branches. 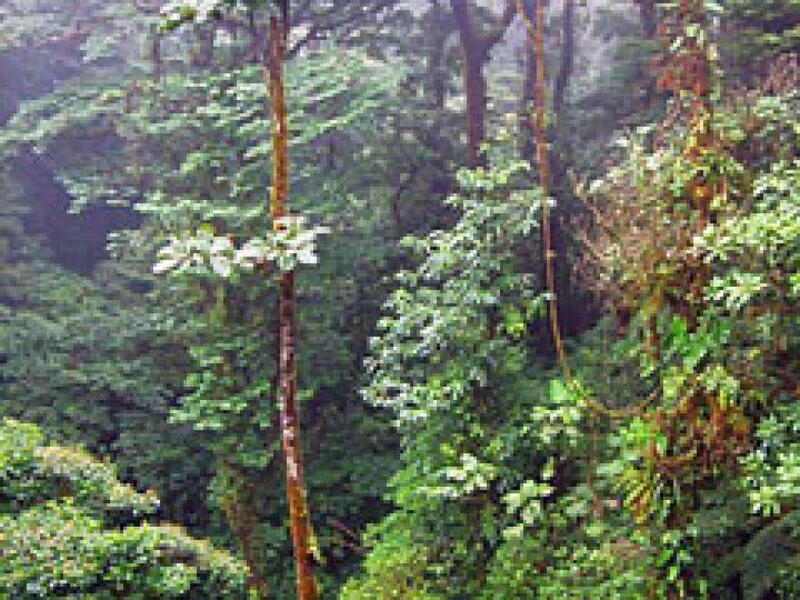 Much biological conservation and research attention has centred on the Monteverde cloud forest. Extensive plant collections have been conducted. An ever-growing list of plants above 700m details more than 3000 species. There are more than 750 species of trees alone, representing 92 plant families. Each type of forest or “life zone”, from the lowland rainforest to the elfin forest, has its own set of characteristic tree species. Believe it or not, even moist forests occasionally need more water. Sometimes the normal pathway of water uptake through tree roots is not enough. Many cloud forests have an annual dry season when water mainly comes from moisture in the clouds, rather than rainfall. Recent field studies conducted near Monteverde showed that trees can absorb the water in clouds directly through their leaves. During conditions like the recent dry season in Costa Rica, with unusually low rainfall, this helps trees to stay hydrated. Water actually enters the leaves and moves down the branches back to the tree’s trunk, in the opposite direction to what typically occurs. The process is called “foliar water uptake”. Tropical montane cloud forests are not only one of the world’s rarest ecosystems, but also one of its most endangered. They are ecologically significant both for their extreme biodiversity and the role they play in watershed ecology. Yet they are threatened just like lowland rainforests, by myriad human pressures: logging, hunting, harvest of forest products, land conversion for agriculture, and fires. Even more worrisome, these mountain ecosystems can be seriously affected by the habitat degradation that is rampant in adjacent lowlands. Forest clearing in lower areas can alter moisture levels during the dry season, affecting cloud formation. This in turn can influence soil structure, nutrient cycling, and decomposition in cloud forests. The two main conservation priorities for Monteverde plants are protection of the many rare species, and preservation of the representative communities that generate such high biodiversity in the first place. Protecting the clouds, however, demands a much more comprehensive strategy. Goldsmith GR, Matzke NJ & Dawson TE (2013). The incidence and implications of clouds for cloud forest plant water relations. Ecology Letters 16:307-314. Nadkarni NM & Wheelwright NT (Eds). (2000). Monteverde: Ecology and Conservation of a Tropical Cloud Forest: Ecology and Conservation of a Tropical Cloud Forest. Oxford University Press, USA. (Chapter 3, Plants and Vegetation, by WA Haber, pages 39-94). An Introduction to Cloud Forest Trees: Monteverde, Costa Rica (1996), by WA Haber, W Zuchowski & E Bello. Contains keys, descriptions and illustrations of 88 common tree species.